So what’s it all about? Les Trois Glorieuses means the Three Glorious Days and is a celebration which marks the end of the harvest period in Burgundy. 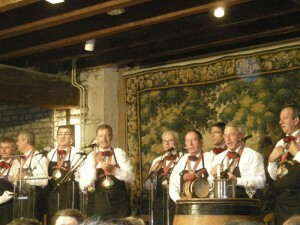 It is made up of three important events on the wine calendar. 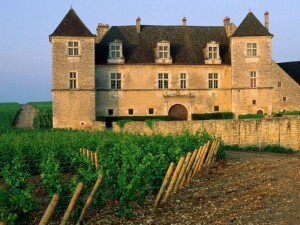 The party begins on Saturday at the renowned Chateau du Clos de Vougeot. The prestigious wine estate is home to the Brotherhood or ‘Confrerie’ of the ‘Chevaliers du Tastevin’. The brotherhood was created in 1934 and is tasked with promoting Burgundy and encouraging the development of tourism in the region. They have a wide remit but their particular focus is on the wines and cuisine of Burgundy along with preserving and reviving the region’s traditional festivals, folklore and customs. Today, there are over 12,000 members of the brotherhood scattered throughout the world. 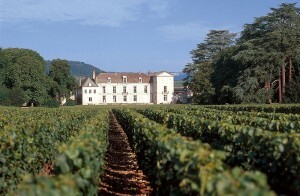 This is just one reason why Burgundy is such a successful international tourist destination! The black tie dinner which is held on the Saturday evening is an invitation only event. If you are lucky enough to have contacts in the wine trade in Burgundy they may be able to secure you tickets for this prestigious event. Don’t miss the opportunity if it comes along. On Sunday, the highlight of the weekend takes place at the Hospices de Beaune. 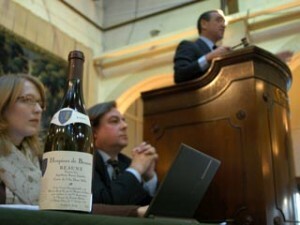 At 14h30, Christies commence the world-renowned wine auction which is open to both professional and private buyers. The barrels, from 31 cuvées of ‘primeur’ red wine and 13 of white, reach prices usually well in excess of the current commercial values. All of the wine originates from vineyards that have been donated to the Hospice over the years. A proportion of the auction sales value still goes towards the care of the sick as it has always done. Contributions are also made towards modernising and maintaining the modern hospital in Beaune. The day’s climax is a grand, formal candlelit dinner in the ‘Hotel Dieu’, the original old hospital. The third great event of ‘les Trois Glorieuses’ is on Monday. This is the occasion of the Paulée de Meursault ‘lunch’ which is held at the stunning Chateau de Meursault. I say ‘lunch’ because the event is actually an all afternoon affair which the French do so well. Winegrowers, their workers, friends, wine experts and writers from all around the world come together for a rousing finale to the wine season. Each invited guest brings along his best bottles (note the plural!) which he is expected to share with his fellow wine enthusiasts. It’s possible to taste over 150 wines during a feast that commences at midday and finishes when the last person staggers out of the Chateau! It’s a party and a celebration like no other. If you are now intrigued about les Trois Glorieuses in Burgundy, do read this excellent article. It’s written by somebody who has first-hand experience of this amazing weekend which is an unmissable event for any serious wine buff. If you are planning on visiting the Burgundy region around the time of les Trois Glorieuses bear in mind that accommodation gets booked up well in advance. Do plan well ahead to save disappointment.